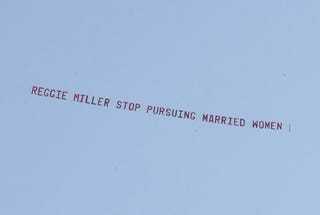 A banner warning Reggie Miller off of married women was flown over southern California beaches. Seems Miller's been accused of trying to dip his Dunkaroos in someone else's frosting cup, and we've got the restraining order to prove it. Maybe Miller's learning some things from TNT coworker Charles Barkley about landing a side piece, but targeting someone who's engaged is never wise. Especially if said woman's fiancé is pseudo-famous and rich enough to take their revenge in a very public fashion. Alex von Furstenberg is a Malibu surf shop owner, but more importantly the son of fashion legend Diane von Furstenberg and stepson of media mogul Barry Diller. He's also engaged to designer Ali Kay. According to the restraining order, which was never filed, Miller is neighbors with von Furstenberg and Kay, and met her at a Fourth of July party last year. In early March, he ran into her at a grocery store, then waited outside for an hour until she left, before following her up the Pacific Coast Highway. He also allegedly harassed her by phone, including sending her 53 text messages over the course of less than four hours. He said he had friends with guns. He implied I would get hurt if I didn't stop questioning him on his inappropriate pursuit of my fiancee and his attempts to subvert his efforts." I was very upset about Reggie's behavior towards my fiancée. I think people in Malibu share my views that being a famous basketball player should not provide some sort of shield against inappropriate behavior. Reggie sincerely apologized to me on a phone call with Ronald Richards, his attorney, and myself. I cannot comment further on the matter as I believe it has been resolved."